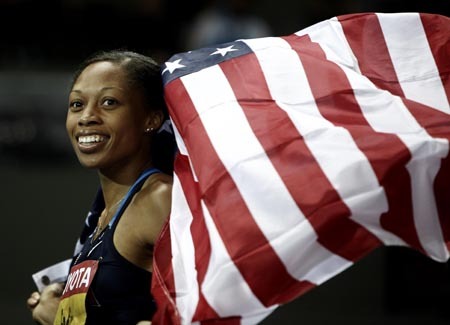 American Allyson Felix beat arch rival Veronica Campbell of Jamaica to win her third successive women's 200 meters title at the World Championships Friday. Felix, silver winner at both Athens and Beijing Olympics, clocked 22.02 seconds for the gold. Campbell, gold medalist in Beijing, finished second in 22.35 and Bahamas' Debbie Ferguson-Mckenzie took the bronze in 22.41. "It is very special for me to win here in Berlin," said Felix. "I have worked really hard. I defended my title -- I cannot ask for more." Felix was defeated twice at the last two Olympic Games by Campbell, but the American had equally easily taken the world titles in Helsinki and Osaka, with the Jamaican finishing fourth and second respectively. The 24-year-old said that a win at the Berlin Olympic stadium was very special compared with the two in Osaka and Helsinki. "They are all different. This one happens in a stadium with a lot of history. This is definitely something special for me." Felix has set sight on a second medal in the 4X100m relay. "I hope I am still on it," she said.